Here at The Paddle Junkie, we live split lives, one life is the 9-5 Monday thru Friday gig and the second is outdoor enthusiast. We found the perfect work boot that allows these two lives to mesh together. 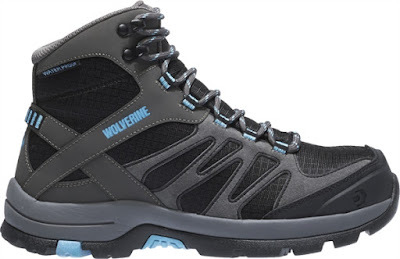 The women's Edge FX from our friends at Wolverine. The newest addition to their women's footwear line and these new boots are perfect for anyone working indoors or out. My day job is manufacturing and I have seen a lot work boots and tried different types but these by far are the lightest & most stylish. The CarbonMAX safety toe makes this boot light weight but the Wolverine technology still gives you the safety you need at any location. With their moisture managing mesh and waterproof technology keep your feet and toes dry. Not to mention the dual-density Wolverine EPX anti-fatigue footbed allows you to be on your feet for 12 hours without paying the price after. These are not your grandpa's stuffy & stiff work boots, the breathable fabric allows gives some breathing room to your feet while you are working.